So I have a long liking of The Balvenie Scotch Whisky and I don’t ever think that will change, but this latest offering opens a new door to me as an enthusiast of Balvenie. If you are wondering if you should buy this as you stand in the whisky aisle I hate to be long-winded but this opinion is going to be a bit drawn out. Balvenie, to the whisky enthusiast, is an easily recognized dram. It’s vanilla and honeyed prevalence is without equal in Scotland’s whisky industry. It is without question one of the first scotch whiskies you should try from Scotland. This one, however, is not that one. 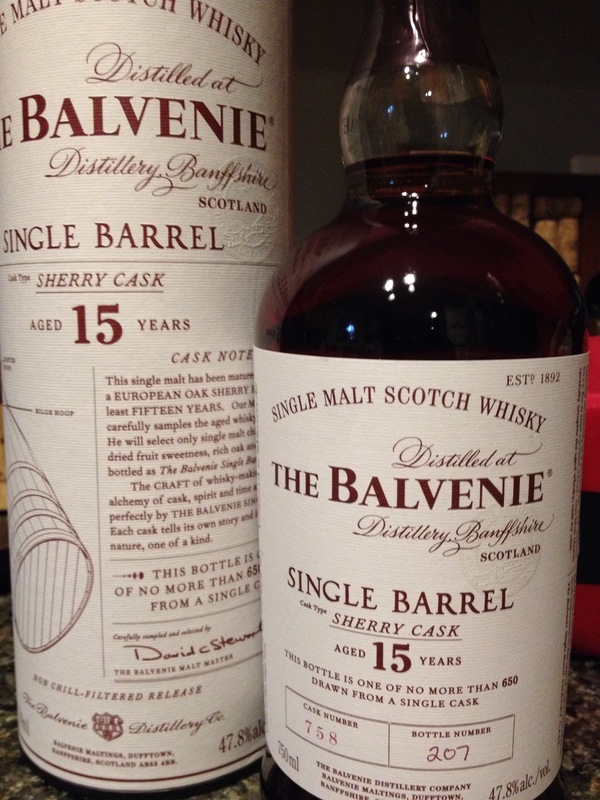 I first tasted this at the Balvenie celebration of American Craft arts in Washington DC. I knew that this was on the shelf in Virginia and soon picked it up to give it a firm break in and evaluation. My overall response is that this is a great whisky but a departure from what I think Balvenie is all about. To me, this is a “special” offering to show that Balvenie can do a Sherry cask as well, or perhaps better, than Macallan can. It’s slightly more powerful than a regular offering at 47.8%, as most Balvenie products come in at about 43%. So, it’s not exactly strong as most single cask offerings but the fact that it has set in the Sherry Cask this long delivers very rich flavor. I’ve tried this without and with water added and I tend to favor it with very little to no water because too much water seems to make it lifeless. I personally think that this product is for people like myself, who enjoy seeing different sides of an established distiller and don’t mind spending 100 USD for a bottle of whisky. I have to compare this to my favorite TUN series from Balvenie and then the Doublewood 12 year “gateway” whisky. It falls in between and personally, I would have saved this for a “vatted” product with some traditional American cask whisky to target an empty section between regular Balvenie offerings and the exclusive TUN series. But I don’t have to answer to Grant & Sons so my opinion is just that. In summation, it’s a quality product but not for the casual drinker, that is what Doublewood 12&17 is for. At this price point I think it’s a great offering for us whisky geeks and collectors. If I were you and didn’t mind the price I’d buy it.